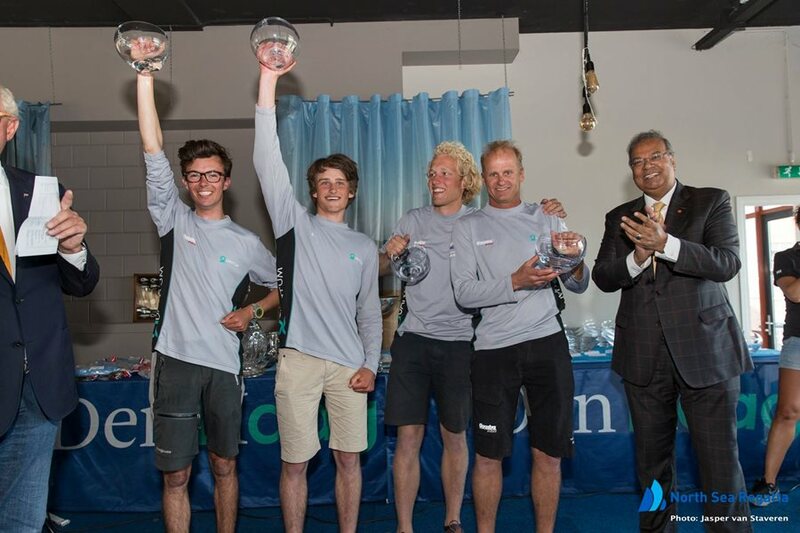 Quantum rep Nic Bol and his crew sailed their way to a J/22 International Class Association World Championship this past weekend at The North Sea Regatta in The Hague, Netherlands. Seven years after winning the event the first time, he’s done it again. After four days of sailing, Nic and his team are the new World Champions J/22! J/22 World Champions - Nic Bol and his crew Christopher Bol, Tim de Weerdt, and Niels de Vries. Photo courtesy of the North Sea Regatta, copyright Jasper van Staveren. Nic’s crew consisted of his son Christopher, who turned 18 during the regatta, Neil DeVries, age 21, and Tim DeWeerdt, age 20. We caught up with Nic to talk to him about his big win. How long have you been sailing J/22s? Since the 1980s. The J/22 is fantastic. Sailing them is a fairly economical way to lift your game in a short period of time. I was one of the first to buy a J/22 in 1991, since its inception in Holland. I’ve sailed many world championships. When I saw that the Worlds were going to be held here in the North Sea again, I decided to put a crew together to defend my title that I won at the same venue in 2010. What’s your style? What’s it like to sail with you? I’m quite an intense guy to sail with, but it’s quality intensity vs. meaningless yelling. I’m serious about the commitment. I put a lot of effort into making sure we peak at the right moment, select the right equipment, practice hard, and select a crew that is dedicated, knowledgeable and most importantly keen to learn . What was the most difficult aspect of this regatta? The current. It gets bumpy in no time at all. The focus had to always be about keeping the boat going as fast as possible. It’s much less important to sail high than it is to maintain boat speed. Around the Mark - Photo courtesy of the North Sea Regatta, copyright Jasper van Staveren. You were sailing with a very young crew. How did you handle that? As most sailing youngsters are (and like I used to be when I was 20), their sailing style is aggressive and impulsive, and even though they’re well-trained sailors who have come up through the ranks in Optimists and Lasers & are versed in the theory of sailing, they tend to make their decisions based on the boat that’s right next to them. I had to work hard to temper that and keep them focused on our race plan and to think about the big picture. 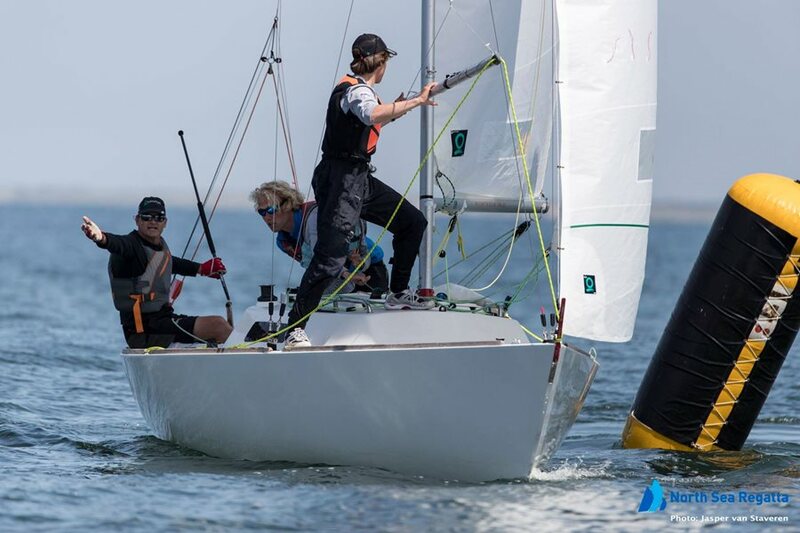 This was obviously their first international regatta where they had the opportunity to finish on the podium, so it was easy to get caught up in the moment. What decision went well for you? We sailed conservatively and didn’t take any unnecessary risks. Our goal was to finish in the top ten of every race. It was up to us to not lose the regatta in the first three days. We got a black flag disqualification midway through the regatta, and that was really a challenging time, with hard words being exchanged. After that, we refocused. That’s when we shifted and the guys really dialed in on the job in front of them. What was the communication like on board? That’s a really good question. Communication is absolutely key. These guys have limited experience in big fleets and important regattas. I told my tactician that I wanted to know everything he was thinking, everything he saw. Talk, talk, talk. Never stop talking. His job was to tell us what his thoughts were all the time. I also made sure he knew he was on notice to say when he didn’t know what to do. You can’t expect any tactician to be able to handle every situation. Sometimes we had to all work together to determine the best way forward. What is your best memory from a spectacular weekend? It was really special to do this campaign and race with my son. I’ll remember that forever. The coolest moment was when we crossed the final finish line and I told the guys, “You are now world champions for the rest of your lives!” They went absolutely mad and it was quite an emotional moment for me! Intersted in your own set of J/22 Championship winning sails? Click here to buy online or contact a class expert.